It may seem odd to describe Wicked as under-rated. It has garnered over 100 major awards, played for 10 years on Broadway, 8 years in London and broken virtually every box office record. But I think it’s a far cleverer show than it is given credit for. It wears its cleverness very lightly. It is perfectly possible to view the show as a spectacular entertainment about friendship, fitting in and conforming, aimed mainly at tweenage girls. But it is equally legitimate to view it as an unbelievably textured and deep examination of the human condition and politics. It’s premise alone is neat: take the most two-dimensional character in Western popular culture and then show a different perspective from which you see that the Wicked Witch is not wicked and the Wonderful Wizard is anything but wonderful. I’ve often thought that any budding actor able to pull off all the elements of Dancing Through Life should be awarded an immediate RADA degree: it covers every possible human emotion and motivation – from jealousy, feeling guilty when teasing becomes bullying, sympathy, love, requited or otherwise, overcompensating when your motivations are questioned and many more – in just seven highly efficient minutes, whilst appearing to be just a jolly little song. In that sense, Wicked is like a pantomime: enjoyable on two levels. Where a panto is about children enjoying the simple plot and silliness, with adults enjoying double entendres, Wicked is a story older kids and teenagers can relate to, but also a surprisingly deep exploration of human emotion. It also examines political idealism, the emergence of totalitarian regimes and why the masses can be persuaded to acquiesce in them, the power of a common enemy in political conflict, the people’s need to believe in higher order power, the power of imagery (Glinda’s appearance as Evita in Act 2, for example) and the echoes of the Bush-era government, including the mangling of language (“Congratulotions”, “an outward manifestorium”). In an era where many shows are jukebox musicals and movie conversions, Wicked is a wonderful epic which one can enjoy more than once and find new insights every time. Eight years in to its West End run, and with Kerry Ellis back in the cast five years after last greenifying herself, how is the production? In short: as good as, maybe even better than, ever. Let’s not pretend that Wicked is an ensemble piece. 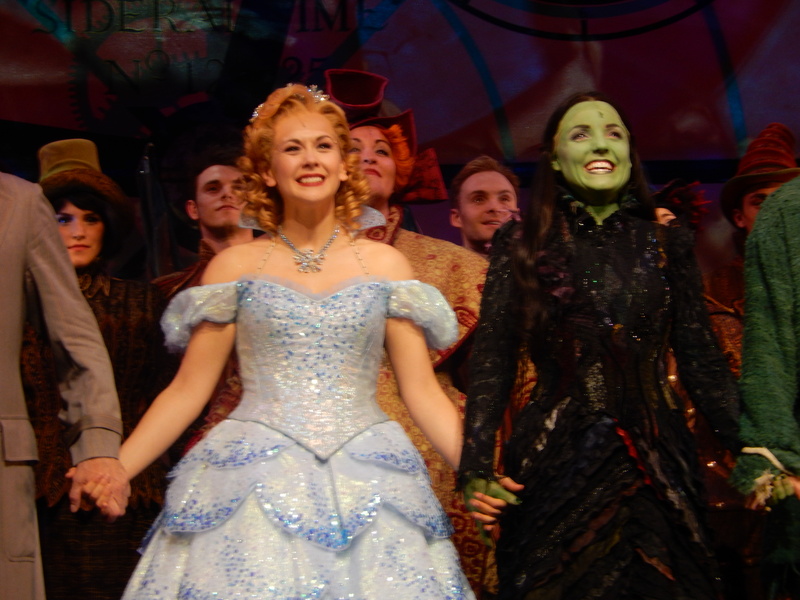 The show is reliant on great performances from Elphaba and Glinda. Savannah Stevenson makes a great Glinda. Her interpretation of the role was a touch more serious than other performances I have seen. She has ever-so-slightly de-emphasised the humour in the role in order to make the performance more credible. Whilst some of the toss-toss and la-la/ler-ler humour is reduced, therefore, the performance overall is that much more authoritative, without, bizarrely, losing any laughs. I came away thinking that this was probably the best interpretation of the role I have seen. Kudos to Savannah Stevenson for such a mature performance. Kerry Ellis is predictably superb as Elphaba. From the moment she walks on, her stage presence conveys to the audience that they are in excellent hands. By the end of The Wizard and I, she has the audience in the palm of her hands. You could wake her up at 3am and she could play the role, having played it thousands of times. But there is no sense of boredom in her performance. She seems as excited to be playing the role now as she was in 2007. Her Defying Gravity is stunning. It’s a real pleasure to be in the presence of the Leading Lady of the West End stage. For showbusinessinsights in depth look at Kerry Ellis’ return to the role of Elphaba after Willemijn Verkaik’s withdrawal due to injury, click here. The key moment of truth in Wicked is For Good. If this works, then the whole performance works. You could hear a pin drop during Savannah and Kerry’s performance and I saw a fair few eyes being dabbed around me. The chemistry between the two is very strong. Incredible that they have only been rehearsing together for days. The rest of the cast is excellent. Sue Kelvin is deliciously authoritative and amoral as Madame Morrible and exploits the role’s potential to its full. On the night I saw Wicked, The Wizard was played by Paul Clarkson, who usually plays Doctor Dillamond (presumably Martyn Ellis was on holiday as no announcement was made). Clarkson, as an Olivier Award winner and the originator of the role of Harry Bright in Mamma Mia, was excellent, being cowardly and morally reprehensible whilst maintaining sympathy in equal measure. Sam Lupton makes a wonderful Boq in his West End debut. The resentment and anger felt by the character as the piece moves on came out very strongly in his performance. Jeremy Taylor exudes confidence as Fiyero and sings very well. I tend to see Fiyero as a Jock/Rugby Lad/Bad Boy/Prince Harry type of character – Taylor plays him slightly more sympathetically than this, but this makes the character a touch more convincing in Act Two, which works well artistically. I had been looking forward to seeing Katie Rowley Jones as Nessarose, having enjoyed her performance in Sister Act, but she was also not performing that evening (again, presumably holiday). Instead we saw Pippa Buxton, who was exceptionally convincing. I’ve often found Nessarose a distant character in Act One, but we saw an element of warmth towards Elphaba from Nessarose that made me re-evaluate the character. Buxton is one to watch for the future and should become a principal in her next role. If I had to find a critical observation it would be that the orchestra felt too quiet – at least from our seats in Stalls Row E. The first few bars of the overture should, in my opinion, shock you out of your seats, which I am sure used to be the case. It certainly feels like that on the OCR. Here, the relative sound level between the voices and the orchestra seemed different and lost a little of the exhilaration. Sound volumes are odd things, though, so this may be a quirk of where I was sitting. If not, however, then I would like the orchestra sound level turned up a little. As Wicked moves ahead of Me And My Girl to become the 14th longest running musical, it is in excellent health and is still the most truly spectacular show in town. Long may the witches rule Victoria. This entry was posted in musicals, Theatre and tagged Apollo Victoria, boq, doctor dillamond, elphaba, evita, galinda, george w bush, glinda, jeremy taylor, katie rowley jones, kerry ellis, madame morrible, mamma mia, martyn ellis, nessarose, paul clarkson, philippa buxton, pippa buxton, sam lupton, savannah stevenson, sister act, wicked, willemijn verkaik by showbusinessinsights. Bookmark the permalink. Kerry ellis is amazing the best elephant by far kerry even beats idina Menzel I really hope kerry will return to wicked again as she is beyond amazing and kerry is what makes wicked .